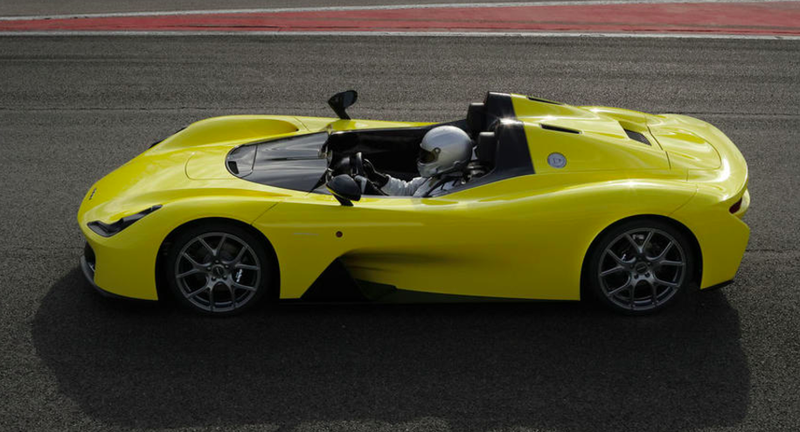 Dallara—the legendary Italian engineering firm that’s developed chassis for Indycar, Formula One, Formula Three, Formula E, IMSA and a bunch of other racing series—has now developed a car for the street and, unsurprisingly, it’s a power-to-weight monster with crazy claimed cornering abilities. With all of its motorsports experience and the vision of its founder, Giampaolo Dallara—who worked at Ferrari, Maserati, Lamborghinia and De Tomaso before starting Dallara Automobili da Competizione in 1972—Dallara seems like it’d be a great maker of road-going sports cars. And now, after putting 20 engineers and mechanics on a two-year mission to “rediscover the real pleasure of driving on the road or on the track,” Dallara has introduced its first road car, the 400 horsepower, 1,885 pound Stradale, which the company says can corner at an absurd (for a road car) 2.0 g.
I like to think that Colin Chapman, which I began to admire since the days of his Lotus Seven, would appreciate the essentiality and simplicity of this car...This project sums up everything we learned from racing and from collaborations with our clients, and I am convinced that those who will use this car will be able to try the pleasure of driving for the sake of driving. They will get in the car to take a nice ride and to experience the pleasure of driving. The car comes standard as a two-seater with neither doors nor a windshield, though the Stradale can be configured in a number of ways. A windshield is optional, as is a “T-frame” which turns the car into a targa. If the customer is more focused on road driving, he or she can add two doors and also a gull-wing opening to turn the vehicle into the coupe; on the other end of the spectrum, if they’re focused on track driving, the owner can fasten on a rear wing for added downforce and even bolt on an adjustable suspension. The standard transmission is a six-speed manual, though an automatic with paddle-shifters is an option (it gets normal and sport modes in both the manual and automatic settings). The body, which is easily the most interesting aspect of this car (unsurprising, considering this is built by a motorsports chassis developer), only weighs 855 kg, or 1,885 pounds thanks to copious use of carbon fiber. Autocar says the tub and body panels are carbon fiber, while the front and rear subframes are aluminum. Dallara says it developed its suspension by having “expert test drivers” work closely with engineers and technicians to decide upon appropriate tuning for springs and dampers. The engine is a mid-mounted 2.3-liter inline four making 400 horsepower. According to Automotive News, it’s actually a Ford EcoBoost with a new valvetrain and a larger turbo. The news site also says the vehicle’s 0-62 mph time is 3.45 seconds, and the top speed is 174 without the wing or 164 mph with it (the latter number corresponding with the insane approximately 1,800 pound downforce figure). The starting cost in Italy for the 600 Stradales that will be sold to customers will be $177,000 (this according to Automotive News, who says 100 have already been spoken for), though if you want a windshield, roof and gull-wing doors, you’ll have to add another 32,000 euro, or about $38,000. So the Dallara Stradale is clearly an exclusive car that I’ll never get to drive. But god what I wouldn’t do for just a few minutes on a track, or—better yet—on the world’s greatest driving road.